"He has a broad range of expertise in personal injury law." Kane has a broad personal injury practice and appears for both claimants and defendants. 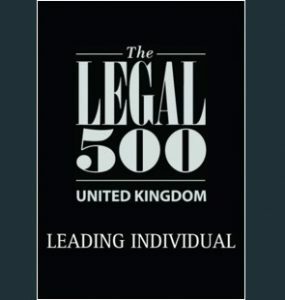 As noted in the Legal 500, Kane specialises in claims involving injured cyclists and motorcyclists. Kane also has substantial experience with road traffic accident claims involving allegations of fraud or dishonesty. He is regularly instructed in public liability and employers’ liability claims. Kane mainly undertakes work at multi-track level. He is regularly instructed in claims with a value of between £25,000 and £250,000. As a result of his practice, Kane has developed an interest and knowledge in procedure and costs, in particular issues involving fixed costs and the newer provisions of the CPR. He is regularly instructed for applications and to advise in matters involving personal injury-specific costs issues. Kane is happy to advise on a CFA basis. He is also available to deliver CPD-accredited seminars to solicitors on request. Recent seminar titles include ‘Making the Most of the Fixed Costs Regime’, ‘Dealing with Allegations of Fundamental Dishonesty’, ‘Introduction to the Intermediate Track’ and ‘Introduction to Pension Loss Claims’. Kane graduated with a first-class degree before completing a master’s degree in law. He has always practised at 18 St John Street and completed pupillage in 2009 under the supervision of Mark Laprell and Simon Kilvington QC. D v MIB: Acted for a claimant who sustained a pelvic fracture in a road traffic accident. Claim settled for £150,000. S v M: Acted for a claimant who sustained a mild traumatic brain injury. Claim settled for £140,000. M v B: Acted on behalf of one of three claimants injured in an industrial explosion. Successfully advised and drafted pleadings to overcome an initial denial of liability. Settled shortly before trial listing for a sum in excess of £100,000. D v I: Advised a claimant injured in a motorcycle accident who subsequently recovered £75,000 in damages. C v P: Advised a cyclist knocked off his bicycle as to the value of his claim. The matter settled for £70,000. C & E v A: Advised in conference and successfully represented two claimants at trial where a low-velocity impact defence was raised. Recovered two sets of fees for solicitors. C v F: Acted for a defendant insurer in a trial where low-velocity impact defence was successful. The claim for injury was dismissed and the claimant only recovered around 10% of the amount claimed for credit hire. Successfully argued that the issue fee should be reduced accordingly. M v B: Represented a claimant in a multi-track road traffic accident claim where allegations of fraud were made. Advised in conference and concluded that her prospects of success were good. The Claimant was found to be honest at trial and succeeded in her claim.